A complex genetic analysis has biologists re-evaluating some long-held beliefs about the way societies evolved following the invention of agriculture—by six-legged farmers. Like humans, leafcutter ants grow crops, and like humans, farming allows the ants to produce enough food to support millions of individuals who work at specialized jobs. But while people invented agriculture at the dawn of civilization about 10,000 years ago, leafcutters began cultivating massive subterranean fungus gardens more than 10 million years ago. 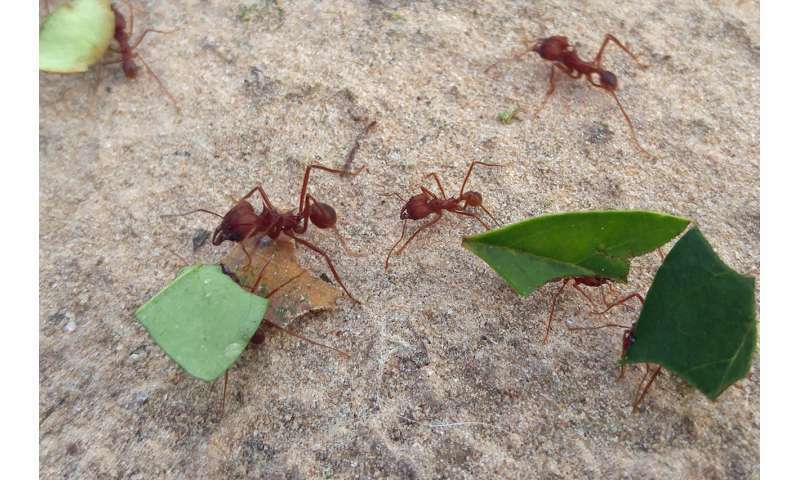 In a study published this week in Molecular Ecology, biologists from Rice University, the University of Texas at Austin (UT Austin) and Brazil's São Paulo State University analyzed genetic data from samples collected at leafcutter nests throughout South, Central and North America and concluded that the ants originated in South America and owe their success to something more than their choice of crops. "The ability to grow domesticated crops was a major turning point in human history and evolution, and we thought, until recently, that a similar thing was true for leafcutters," said study co-author Scott Solomon, an evolutionary biologist at Rice who collected many of the study's samples as a graduate student and postdoctoral researcher at UT Austin and the Smithsonian Institution in Washington, D.C. "Our findings suggest that several of the things we thought we 'knew' about leafcutters are not true." The research, led by co-author Ulrich Mueller, Solomon's longtime UT collaborator and mentor, is available in both the newly published paper and a 2017 companion study, also published in Molecular Ecology. "This study started 20 years ago as a collaboration between Brazilian and Texan labs and developed into a huge collaboration involving 22 labs surveying leafcutter ants in 17 countries," said Mueller, the William Morton Wheeler-Lost Pines Professor in UT Austin's Department of Integrative Biology. "Because of this international effort, we now have a comprehensive understanding of leafcutter ecology and evolution." Leafcutter ants are found only in the Americas. More than 40 species range from Argentina to the southern United States, and they are a dominant ecological player in any forest or grassland they inhabit. "They aren't the only ants that grow fungi, but if you compare leafcutter ants with other ants that grow fungi, there are many differences," Mueller said. "For starters, no other ants use freshly cut leaves to grow their fungi." Ants that grow fungus on dead and decaying leaves have been around even longer than leafcutters, probably about 50 million years, Solomon said. But leafcutters' ability to use living leaves was a quantum leap in evolutionary terms because it opened up the entire ecosystem. For example, Solomon said, the ability to consume plant matter they cannot directly digest allows a nest of leafcutters to consume about as much vegetation each year as a full-grown cow. "Once you can use fresh leaves, it gives you access to so much more food," Solomon said. "If you can grow and raise your crop on any leaf that's growing out there, then the sky's the limit." In comparison with other fungus-growing ants, leafcutter colonies are enormous, Solomon said. "They're on the order of millions of individuals. Some leafcutter colonies are so large that they show up on photos taken by satellites in space." Leafcutters also have specialized tasks. Individual worker ants come in different sizes, and they have different jobs. "Some are specialized on raising the young," Solomon said. "Others are specialized on removing weeds and disease inside the nest. Others are specialized on going out and finding food, and yet others are specialized on defending the colony. "All of the specialization is unique to the leafcutters," he said. "With other fungus-growing ants, the workers are basically interchangeable. They don't have these specialized tasks. "One of the long-held truths of our field was that leafcutters grow a special and unique kind of fungus that no other ant could grow," Solomon said. "It was thought that something about that unique crop allowed them to do these things that other fungus-growing ants couldn't do." The new studies, which are the first to analyze the genes of fungi from hundreds of leafcutter colonies across the Americas, found instances where other ants grew the specialized "leafcutter-only" fungus, as well as instances where leafcutters grew more generic fungal crops. "It's not the crop that makes them special," Mueller said. 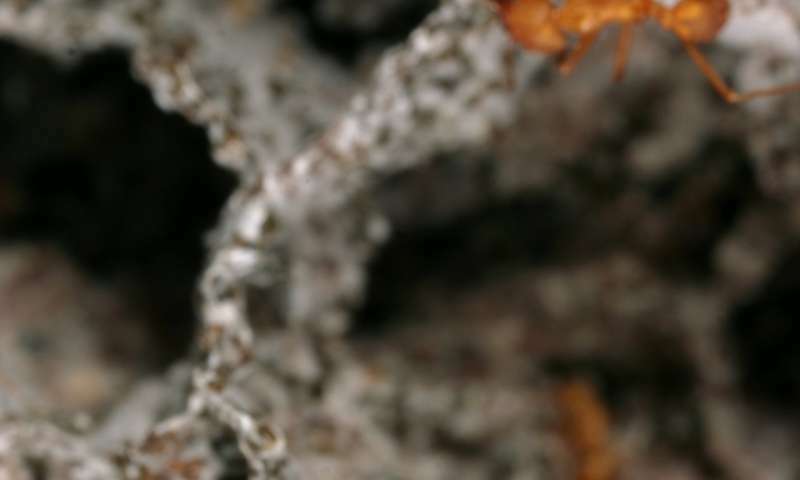 "We found that leafcutter ants and their fungi have co-evolved, and while that's not a surprise, the evidence suggests that this co-evolution occurred in a more complex way than previously believed. "For example, we found that the type of fungi that was long thought to be unique to leafcutters can be grown by other ants on dead plant material," he said. "In one case, it'll be grown on fresh vegetation, and in another case, it won't." Solomon said, "The question is what gives this fungus the ability to digest freshly cut leaves? It's not something that is inherent in the fungus. There seems to be something about the way the leafcutter ants are cultivating the fungus that gives it that ability." Solomon began collecting leaf-cutting ants and their fungi in Central America in 2002 as a graduate student in Mueller's lab. In 2007 Solomon expanded his work, thanks to a National Science Foundation (NSF) international postdoctoral fellowship that allowed him to spend a year working with study co-author Mauricio Bacci Jr. at São Paulo State University in Rio Claro, Brazil. Solomon's samples and dozens of others gathered over the years by Mueller's and Bacci's teams allowed the researchers to pinpoint the origin of leafcutters to South America, probably in the grassland plains of what is now southern Brazil and Argentina, Solomon said. "We sampled tons of different nests of leafcutter ant species throughout the entire range of all leafcutters, which goes from Texas in the extreme north down to Argentina," Solomon said. "What's novel about our approach is how much sampling there was, particularly in South America. In the past, there has been a lot of sampling, but it was focused in just a few different regions, particularly in Costa Rica and Panama. "It turns out the leafcutters in those places don't represent species that live elsewhere," he said. "By going and sampling in other places, especially in the open grasslands of southern Brazil, Paraguay and northern Argentina, we were able to show that the greatest genetic diversity of leafcutter fungi is in South America. Usually, wherever there's the greatest genetic diversity is where a group originated. That is true for humans, and that's just generally true of other species, and that leads us to believe the leafcutters originated in the grasslands of South America." Mueller said, "The study illustrates the importance in science of re-evaluating entrenched assumptions, amassing large data sets and collaborating internationally before reaching conclusions."